Advanced telematics offer proximity features that use virtual boundaries, such as geofencing and perimeters, to track the activity of equipment, trucks and workers. When your business depends on people or things being where they’re supposed to be, you can’t afford gaps in visibility or accountability. By setting a virtual boundary around important geographical locations, you can monitor activity within this boundary in real-time and receive alerts when your things enter or exit this designated area. We call these virtual boundaries geofences. Fixed Geofences: If you’re pulling someone from an important job to locate equipment, there’s a better way to track your things – telematics. Telematics systems generate massive streams of location, utilization and diagnostics data. To find value in large volumes of telematics data you need a rules-based engine that decides what events to act on. Sometimes you only need to know when something moves in and out of a specific area. The most effective solution is a fixed geofence. Construction companies, for example, that use telematics to monitor a mixed fleet of equipment can draw geofences around construction sites to alert them if idle equipment wanders away during the off season. Mobile Geofences (Perimeters): Geofences are fixed to a geographical location, arbitrary, and can take any polygonal shape. Perimeters, on the other hand, are tied to fixed or mobile assets. For long-haul trucking companies, outward-facing perimeters can detect the nearest RaceTrac. Or dispatchers can rely on perimeters to assign jobs or verify service delivery once a field service technician crosses into a geofence. In either case, your telematics system should be able to handle overlapping so that you can detect when an asset enters one, exits another, or is in multiple geofences at once. Eliminating manual dispatching and increasing fleet visibility can help to reduce costs, boost productivity and increase customer satisfaction. Time-Series Geofences: If you’re managing a fleet, there may be times where you’ll want to know how drivers were performing at a specific time or place, particularly when accidents or complaint calls are involved. A time-series geofence allows you to run queries over historical data and produce a replay of past events. Some cities and municipalities rely on time-series geofences. If residents complain about speeding squad cars, law enforcement agencies can create a time-series geofence over the resident’s neighborhood and look at activity during a specific time period for all police vehicles only. 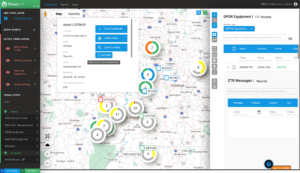 To get the most out of your telematics solution for geofencing and setting perimeters, visit thingtech.com/products/thingtech-real-time today.